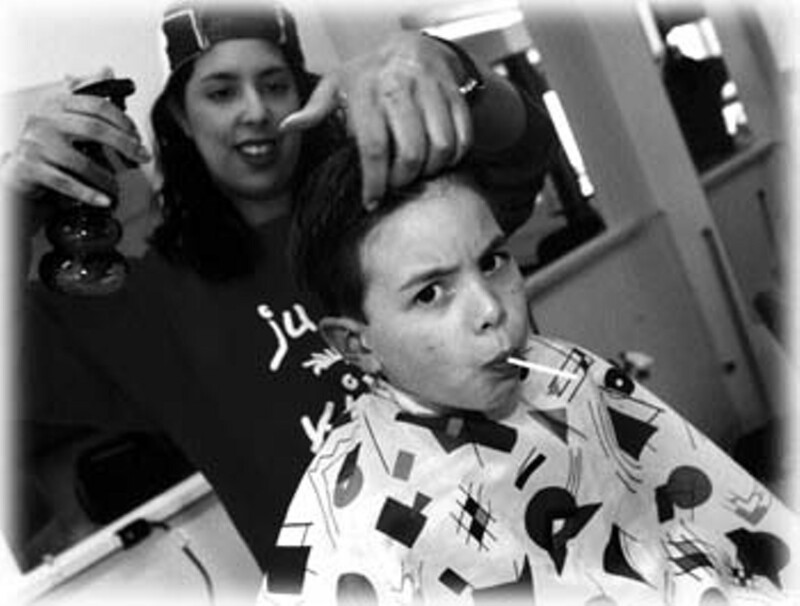 Just a Little Off of the Top: Evan Castro gets clipped by Desiree Casanova at Just Kidz Kutz. A CERTAIN FELLOW we know is fond of describing his philosophy of child-rearing. "When a kid is born, you lock them in a barrel and feed them through a hole until they are 18. Then," he concludes merrily, "you plug up the hole." In addition to recommending that he never have children, we must point out that this unfortunate man was raised in a boring suburb of Los Angeles that afforded few entertainment opportunities other than one would find inside a barrel. Had he been a child in Sonoma County--enticed daily by such delights as ice-skating with Snoopy and wandering the mystical trails of Armstrong Woods--even he might view spending time with a child as the eye-opening adventure it often can be. Sitting out on a blanket in the enchantment of a midsummer night's dream with a child on your lap is easily one of the finest ways to enjoy the dizzying wonder of a Shakespearean play, and the clover-scented, oak-shaded glen of Sonoma's Dunbar Meadow is easily one of the best settings in which to enjoy it. While the county is lousy with Shakespeare festivals, none of these festivals are in any way lousy, and the productions by the Valley of the Moon Shakespeare Festival are notable for the loveliness of the setting as well as their unique approach to the limberness of some of the finest words ever penned in the English language. Pack an ample picnic and beam in pleasure as your children sit very, very still for the oddly uttered antics on the stage. Best about Dunbar Meadow (an attribute it shares with the also awfully good Sebastopol Shakespeare Fest) is that play equipment stands nearby should a child become restless during the soliloquy. As a parent who had to drag her children crying from Sebastopol's production of Hamlet before the much-promised sword fight because of the late hour, I can vouch that the play equipment is rarely considered. Cross-dressing, star-crossed lovers, and a jewel hanging in an Ethiop's ear are. Valley of the Moon, 11700 Dunbar Road, Glen Ellen. 996-4802--G.G. For an aviary that will shame the collections in most zoos, you need venture no farther than a quiet lane within sight of Elsie Allen High School. Waldie and Bonnie Scheffler's Santa Rosa Bird Farm is home to breeding pairs of 75 species, from tiny doves to towering ostriches. But the incredible variety of pheasants, peacocks, parrots, and other species, with their dazzling plumage, is the big attraction. These are breeding pairs, best left alone from February to June, but through the summer and fall they are a colorful and educational destination for visitors of all ages. By appointment only; call ahead. Santa Rosa Bird Farm, 1077 Butler Ave., Santa Rosa. 546-1776--B.R. Right now, you can hear the creek chattering alongside the vacant pools at Morton's Warm Springs, but when the Kenwood resort reopens in May, forget it. Instead, the air will be filled with other splashings--the sounds of kids vigorously enjoying themselves. Morton's got its name from the family that established the resort and upgraded the waterworks back in the 1940s, but there have been popular, public hot springs on the site since before the Wappo Indians gave way to the winemakers. Nowadays, expansive lawns and playing fields, and a platoon of picnic tables augment the aquatic attractions, which are still filled daily from the 92° springs on the property. Open daily from May to September, with slightly lower rates and shorter hours on the weekdays, the resort also offers season passes for frequent visitors. Morton's Warm Springs Park, 1651 Warm Springs Road, Kenwood. 833-5511.--B.R. There must be something about the meandering oval that Spring Lake makes as it laps around its shores that fools the immature eye into thinking that the end is just around the corner, that the car is parked in just the next lot, and that the TV might still be warm at home. With the generous aid of this illusion, enterprising parents find it easy to lure ordinarily hike-less tykes around to the next grassy corner, up to the next sighting of a great white heron, and down to the next good climbing tree when walking around Spring Lake. Gently graded, with ducks aplenty, a parcourse for the ambitious, and a great summer swimming hole, Spring Lake catches sunset in the reflection of its waters and helps even the most recalcitrant young adventurer forget his or her Sega-side and savor the deeper, primal joys of stuffing filthy old feathers down a sibling's pants and racing ahead to hide from mom or dad in a dark tree. Camping, picnicking, boating, and biking, too. 5690 Newanga Ave., Santa Rosa. Day use, dawn to dusk. Free admission. 539-8092--G.G. It's a rite of passage. Every kid dreams about snaring the big one. But just don't try to convince your child that the real joy of fishing is sitting in the sun on the shore of a tranquil freshwater lagoon while watching the wildlife. Kids know the point of the cast: the catch. Hagemann Ranch Trout Farm--which features a well-stocked pond surrounded by fragrant eucalyptus and a cool coastal clime--is the perfect place to fulfill that dream. You can rent a rod, buy the bait, and the helpful staff will even show you how to cast the darn line. Pay $2 for each fish caught (no catch and release allowed). But here's the best part: they'll even clean and ice the fish for no extra charge. Pack a picnic and make a day of it. Hagemann Ranch Trout Farm, Hwy. 1 north of the Bodega Hwy. intersection. Open April (weekends only until June) through November. 876-3217.--G.C. This spot probably doesn't apply to those with haughty teenagers who would rather eat razor blades than be trapped in public with their parents, but for those whose children still like them, the plaza in Sonoma is a marvelously low-key time-waster. The ducks are always hungry for the greening heels of bread, the play equipment includes high-flying, lofty swings; there are lots of trees for shade and for desperately scrambling up, and long stretches of unfettered grass on which to stretch, unfettered. Move with the deliberate, attentively eyed slowness of an oil dowser, and traverse the square. A different aspect is found on each side, and the children can't get lost no matter how far they caper ahead. Simply round the next corner.--G.G.